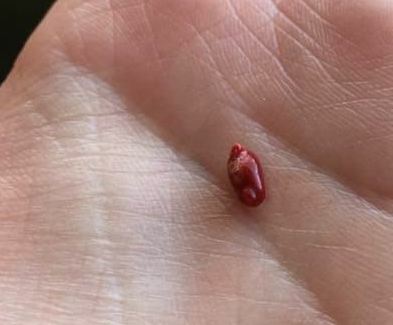 For the past year my guinea pig, Maves, has been randomly peeing blood and passing a very strange object. The thing he passes is very soft and hollow. I cut one open and the inside lining was embedded with crystals and very gritty. He has been to the vets office more than 5 times and all but one time his xrays had been clear. 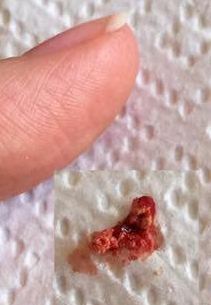 One xray showed a very, very tiny stone. The vet didn't want to send out whatever he passed and guessed it could be from his colon. 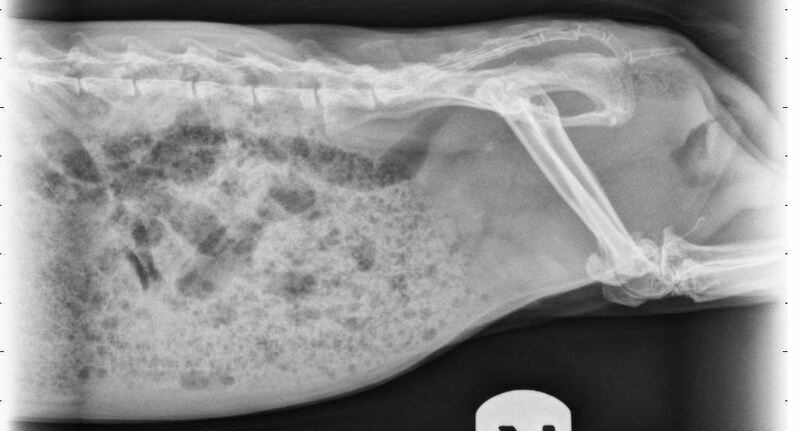 I had sent pictures to another vet who thought it was related to stones/calcium crystals. This past Saturday he passed another one of these things and continued peeing blood for 3 hours. During this whole thing he acts completely normal and does not seem to be in any pain at all. I gave him rimadyll anyway, just in case he was hiding his pain (he has a prescription because of past GI issues and he has arthritis). I opted not to take him to the vet since he was acting fine and every other time I am just told to give him rimadyll and flush his bladder with water (which I also did). Now comes tonight. I noticed he wasn't acting himself. He seemed very uncomfortable and was walking strange. I took him to the emergency vet along with the thing he passed and I requested an x-ray. The emergency vet believes the thing he is passing is a mucus plug and the x-ray showed he has 4 very small stones. She advised me to follow up with the exotics clinic he typically goes to for furher treatment. What can I do for him? They gave him sub-q fluids while he was there and the location of the stones tells me he is more than likely passing them tonight if they can be passed. He still seems really uncomfortable and can't have another dose of rimadyll until 7am (its midnight now). If he manages to pass these, how can I prevent this? His urine is always full of crystals, it doesn't seem to matter what I do. I have almost completely cut out his pellets. He gets maybe 1/16 of a cup a couple times a week. He gets his lettuces twice a day, bell pepper in the morning and cucumber in the evening. Unlimited timothy hay from Small Pet Select. I'm at a loss here.... any advice is appreciated. I have pics of the x-ray and the thing he passed but I can't figure out how to attach them. He could be passing sperm rods. They're a little gritty, and are tubular-shaped. I don't know whether they're hollow or not. I've known of one pig that passed so many that the vet recommended neutering him, which seemed to take care of the problem. You may have a pig that's just genetically prone to crystals and stones. Diet doesn't seem to help much in those cases. Making sure he gets extra liquid may help, and you could syringe him some pedialyte. Most pigs love it, and will happily drink 10 cc or so at a time. Thank you for responding :) it is definitely not a sperm rod (He had one of those stuck once and I got it out). This thing looks like an organ, its flesh toned and usually the size and shape of a poop. I can usually get him to take water from a syringe but when he isn't feeling well he is pretty moody and doesn't want to be touched (understandable) so it will likely be a fight to get the extra liquids in him. Is there a specific pedialyte to get? I think I got the clear, unflavored one once when he was ill but he wouldn't take it. Mine like the plain stuff, but it comes in other flavors. If it's not a sperm rod, I have no clue what it could be. If you can't figure out how to link to a picture, send Lynx a message and she'll post it for you. Last edited by anjuhluh on Tue Dec 05, 2017 1:19 am, edited 1 time in total. Are the stones small enough for him to pass? The objects could be fragments of tissue from the bladder lining. That would explain crystals and sludge inside. I haven't heard of such case before, however I am not a vet, so I don't have enough clinical experience. Nevertheless, the presence of such globules in urine means, in my opinion, some serious urinary tract inflammation. I have no idea what to do to treat the problem, besides standard UTI treatment. I am afraid that, since tendency to form stones is genetical, there is not much that can be done to get rid of the problem permanently. Thanks Kimera, I was having similar thoughts of the crystals irritating the bladder lining and sloughing it off. A urinalysis was done and there was no bacteria present, just calcium crystals so there was no antibiotic or anything else given. Maves gets a urinary support tab from Oxbow (as well as a joint support tab) but I'm wondering if there is something else that could coat the bladder or strengthen the tissue. He still seems to be walking sort of oddly and I don't know what could be contributing to that other than the stones may be irritating him. Ditto Kimera. I think of clots and/or bladder lining. Have you read over www.guinealynx.info/stones.html ? There may be some good ideas on that page. Are you giving romaine lettuce? If so, I would avoid it. Let me know if you'd like me to add your pictures permanently to this thread for future readers. I don't have any idea what that is, but I disagree that it's bladder lining, especially the one in the palm of your hand. It's too well-formed and regular to be tissue that has shredded off the lining of the bladder. 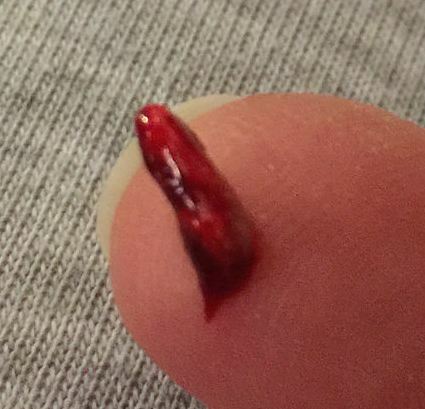 The one on the tip of your finger looks like it might have formed in the urethra. I'd be seeing another vet. Even if those things are from the colon, and with all the urinary bleeding I don't see how they could be, they're still not normal. Do you guys think those stones are small enough for him to pass? I called the vets office and they are refusing to look at the x-ray without me bringing him in for a follow up appointment so they won't even tell me if they are small enough or not. I need to find another clinic but there are no vets around that are certified to treat small mammals. The problem is the clinic did an overhaul, got rid of the small mammal specialist (who was awesome) and all of the vet techs and it has gone way downhill since then. Feel free to make those pics permanent, Lynx. It's hard to tell from an x-ray if stones can pass. If they're smooth, they might. If they're rough or spiky, probably not. But you could try some shilintong, which relaxes the urethra and makes it stretchier. And if you then could get a vet to give him, or teach you to give him, a sub-q, it might flush the bladder out. I usually just flush his bladder by syringing him water. I think last time they said 13 mls of water will flush the bladder and I usually try to give him more than that in case he dribbles some of it out. I sent a message to one of the vet techs that I trusted and asked her if she knew of any clinics that could help him. I am hoping she sees it and is willing to respond. I added a crop of the largest size to display the pics. It is hard to tell how large the stones are. That tiny stones existed in the matter that was passed may be an encouraging sign if the other stones are too large or rough, as bpatters points out. The shilintong is definitely worth giving a try. Our vet prescribed valium to relax the urethra and meloxacam for pain in hopes our pig might be more likely to pass stones. They're shaped like poops which makes me think they're coming from the colon. They look too big to pass thru the urethra, but what do I know. Maybe they're soft enough to be shaped by the urethra? I've never seen anything like that. I'd try another vet. ASAP. This site has a list of recommended vet grouped by state that might be helpful. Very good point, Bookfan. An interesting observation on the shape. Similar to valium, my vet once prescribed ativan as a muscle relaxant to help pass a stone. My guinea pig did pass the stone successfully about a week later. I can't say if it was due to the ativan but it didn't hurt. I was also giving her shillintong and veggies and fruits with the highest water content. We've got 2 stone pigs right now. One's going in today for a suspected bladder infection, which frequently happen with stones. We'll also get set up to do sub-q's at home for Pepper who has both stones & an infection. The sub-q's will help flush the bladder.